This Blind Man use tongue-clicks to navigate the world! Daniel Kish who has been blind since he was 13 months old. When Daniel Kish clicks his tongue, the world answers back. Cars, trees, doorways, bollards on the pavement… all are identified and mapped in his brain using information gleaned from a series of sharp little taps of his tongue against the roof of his mouth, two or three times a second. From an early age, the Californian developed a sonar technique which allowed him to navigate using echoes from repeated tongue-clicks. The echoes from his clicks inform Kish about an object's distance, size, texture and density. It's enough for him to differentiate between, say, a metal fence and a wooden fence. 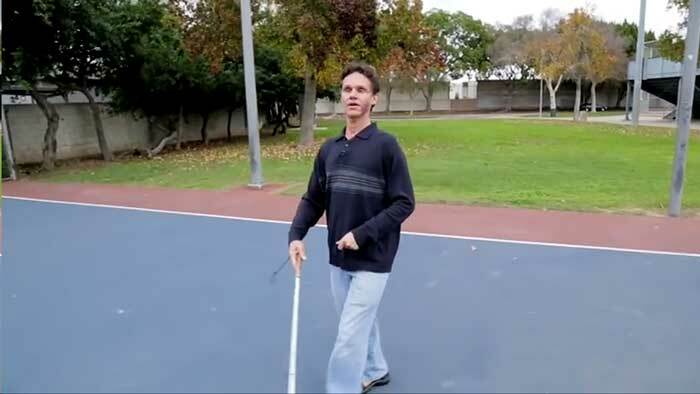 He is an American expert in human echolocation and President of World Access for the Blind, a non-profit founded in 2000 to facilitate "the self-directed achievement of people with all forms of blindness" and increase public awareness about their strengths and capabilities. Kish and his organization have taught echolocation to at least 500 blind children around the world. He also holds masters degrees in developmental psychology and special education.